The Stop-Go Loading Dock Safety Light Set greatly increases worker safety and is the best visual communication package for most loading docks. The set consists of two light units, the SG10 and SG20 for the inside and outside of the dock. A six-foot communication cable connects the two units. The set operates with a toggle switch that controls the inside and outside lights. The SG30 can be ordered without the toggle switch (indicated by "NS" in the part number) for installations utilizing a remote switch. Remote switches can be obtained from an electrical contractor or installation professional; they are not offered by Tri Lite. When a truck is parked securely in the loading dock, the inside light is turned green. This indicates to the forklift driver that it is safe to enter the trailer. 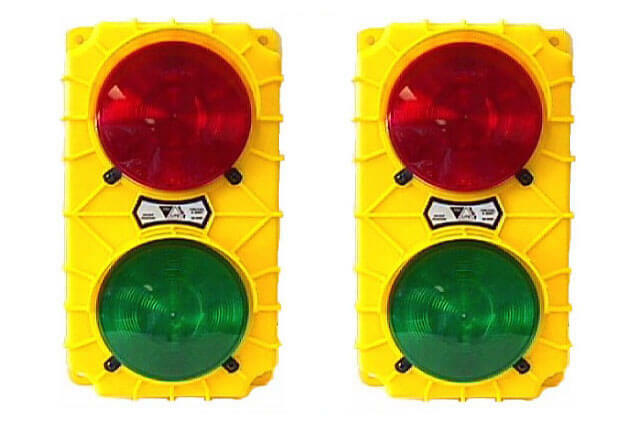 When the green light is on inside the building, the outside light is red, indicating that the truck should not move. Once the truck is unloaded, the inside light is turned to red. This tells the forklift driver to stay away from the truck. 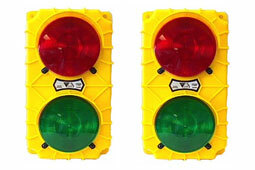 Simultaneously, the outside light is turned green, indicating it is now safe for the truck to pull away. Provides immediate and recognizable direction to drivers and loading dock staff, reducing the risk of confusion and error. Can be used anywhere a visual communication system is needed. Available in two colors: safety yellow or black. Polypropylene housing will not rust, pit, dent, or corrode like similar metal units. 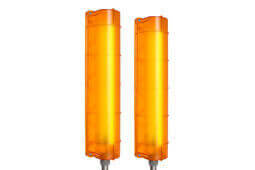 Choice of incandescent or LED lamps. No switch option available for customers who want to supply their own controls. Rated for indoor or outdoor use, IP54. Note: All incandescent "Stop & Go" lights must flash to prevent lens from warping. It is not necessary for LED lights to flash. * Model comes without a toggle switch for installations utilizing a customer-supplied remote switch. ** Model supplied with 3-prong power cord.